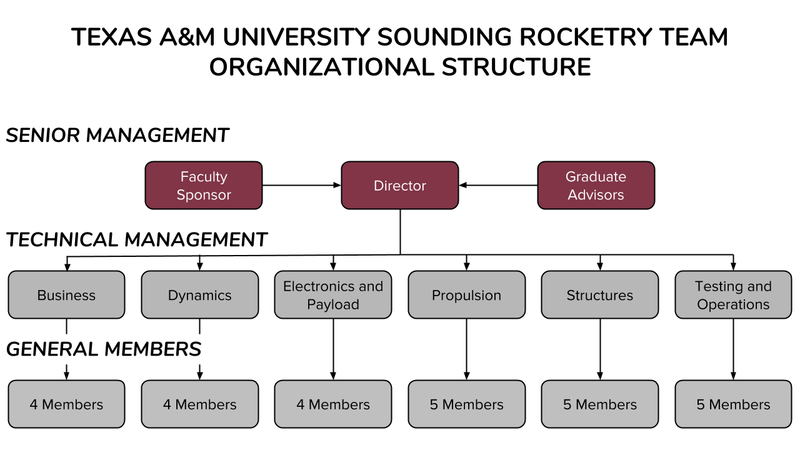 The Texas A&M Sounding Rocketry Team (SRT) is an interdisciplinary student-run organization dedicated to developing engineering talent through design, construction, testing, and showcasing of complex rocket system powered by hybrid rocket engines. Our goal as an organization is to succeed in the Intercollegiate Rocketry Engineering Competition (IREC) hosted by the Experimental Sounding Rocket Association (ESRA) each year. We divide our workload over six sub-teams in order to fully manage the responsibilities of assembling a rocket. Although funded in part by the university, we require assistance from other sponsors in order to create the parts required for our rockets. Unlike other rocket teams, we craft everything down to the outer shell of the rocket from our very own design labs in Texas A&M University. Our members are dedicated, and each student is expected to spend roughly 20 hours per week on activities related to the organization. Learn more about our team with the links below.